By Stephen Conaty | November 14, 2013. St Vincent’s have been crowned Dublin senior champions for the first time since 2007 after a close encounter with Ballymun Kickhams in Parnell Park on Wednesday last. In a high octane replay of the drawn final the previous Sunday, Ballymun led throughout and only a last gasp effort from Cameron Diamond in the closing stages ensured a one-point victory for the Marino men. Kickhams were the better side in the opening stages thanks to Dublin county star Dean Rock who powered the defending county champions to a 1-2 to 0-0 lead after just five minutes. Leading the line from the forty, Rock scored 1-5 overall as he showed just why his place in next year’s county set up is all but guaranteed. He converted an early penalty awarded after a foot block in the square. 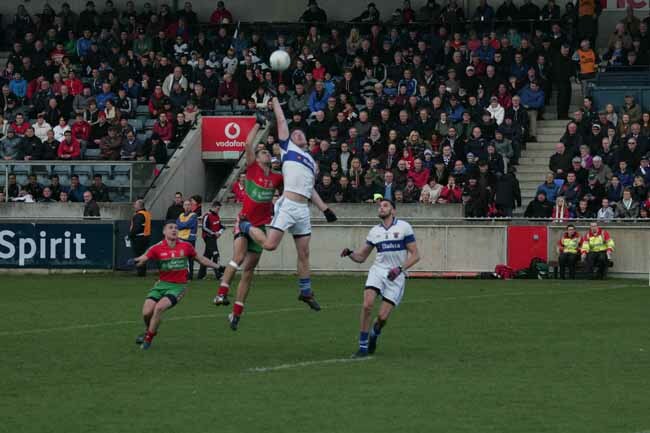 Ted Furman had pushed Ballymun five points clear before Diarmuid Connolly finally got Vincent’s off the mark. The Marino outfit began to get into the game and pushed on dominating possession, but were guilty of poor shooting. Ciaran Dorney eventually bagged them a goal after excellent link up play with Tomás Quinn, who went on to score an equalising point in the 20th minute. Ballymun had reasserted themselves by half time, however, and points from Dean Rock ensured a 1-5 to 1-2 lead at the break. 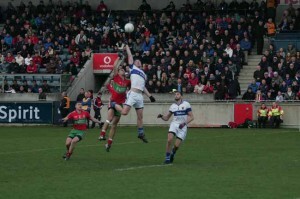 The 6,000 strong crowd, which turned out in the cold and drizzly conditions, were treated to a half time spectacle of a one on one impromptu battle between the four year old nephews of St Vincent’s captain Ger Brennan, who managed to find themselves on the biggest stage of their lives. A video of their exploits has gone viral. Ballymun were quick off the mark at the restart with a fine score from Derek Byrne, before both sides exchanged a series of points. The defending county champions had an uneasy lead of 1-8 to 1-5 with 14 minutes to go and didn’t manage to score for the remainder of the game. Both teams were reduced to 14 men after Dublin county panelists, Diarmuid Connolly and Philly McMahon, were dismissed for an off the ball incident. It was Vincent’s who kicked on to dominate the closing stages, after points from Tomás Quinn and Kevin Golden equalised the scoreboard. Cameron Diamond put Tommy Conroy’s team on top for the first time in the 59th and final minute, with the game finishing 1-9 to 1-8 in favour of the former All-Ireland champions, St Vincent’s. St Vincent’s will go on to play Westmeath champions, St Lomans, in the quarter final of the Leinster Club SFC this Sunday at Cusack Park, Mullingar. Click here to watch St Vincent’s celebrate their victory.